No one seems to know exactly how many Soviet Jews were secretly executed by the Soviet Union in the basement of Moscow’s Lubyanka Prison on August 12, 1952. A 1970 New York Times report on the fate of Yiddish in the USSR claimed the victims numbered around 30. A 1972 volume commemorating the event, released by the National Conference on Soviet Jewry, had the number at 24. The Jewish Virtual Library lists the names of 13 victims, a number corroborated by the The Jerusalem Post and Haaretz, but the Jewish World Review has their number at 15, as, with a caveat, does a chronicle of the Stalinist Soviet Union’s anti-Semitic turn, “Stalin’s Secret Pogrom,” published by the United States Holocaust Memorial Museum. Yet it’s largely agreed that five of those figures were poets and writers, some of them high-profile figures both at home and abroad. 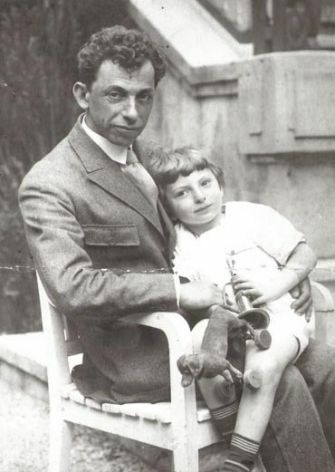 The Yiddish writer Dovid Bergelson holds his son, Lev. The poet Perets Markish was the only Soviet Yiddish writer to receive the Order of Lenin, one of the U.S.S.R.’s most high-profile honors. (He was awarded it in 1939.) Dovid Bergelson, who published articles and fiction in the Forverts from Berlin in the 1920s, was thought by some to be the fourth great pillar of Yiddish literature, after Mendele Mokher Sforim, Sholem Aleichem and I.L. Peretz. In 1922, Dovid Hofshteynpublished a collection of poems about Ukrainian pogroms called “Troyer” — in English, “Mourning” — that was illustrated by Marc Chagall. Yet the full cultural cost of the massacre now known as the Night of the Murdered Poets remains, as evidenced by the confusion over who, exactly, was killed, unclear. In a 2015 video for the Forverts, Boris Sandler described the Night of the Murdered Poets as marking the end of Jewish hopes for a future in the Soviet Union. Sandler’s statement is true not just because the event marked a decimation of Soviet Jewish culture, but also because it served as the culmination of a years-long political turn against the Soviet Jewish community. The victims of the August 12 massacre were all members of the Jewish Anti-Fascist Committee, formed by Josef Stalin’s government in 1941 to boost support for the Soviet war effort against the Nazis, primarily by working to encourage Western support for the Soviet military alliance with Western powers. While that committee, headed by Solomon Mikhoels, director of the Moscow Yiddish State Theater, was successful in its mission, raising substantial funds for the Soviet war effort from North America and England, it advocated for additional goals that the Soviet government considered out of line with its own interests, including the creation of a Soviet Jewish state in Crimea. Once the war was over, the committee’s activism became a political liability. And upon the 1948 founding of Israel, which Soviet Jews heralded with a vocal rally for Golda Meir when she first travelled to Moscow as a representative of the fledgling state, the Stalinist government was threatened by the possibility of Soviet Jews bearing allegiance to a non-Soviet country. Tortured into confessing to various crimes, the defendants, testifying in secret proceedings in Moscow’s infamous Lubyanka Prison, endured a dramatic two months. The trade unionist Solomon Lozovskii refused to go along with the state’s suggested narrative, drawing explicit parallels between the trial and the torments his ancestors had undergone during the Spanish Inquisition. Others followed his lead, reneging on their confessions; on the night of August 12, they — however many “they” were — were executed in the prison’s basement. Chaim Grade’s poem “Elegy for the Soviet Yiddish Writers,” published in a translation by Cynthiz Ozick by the National Conference on Soviet Jewry in its 1972 commemoration of the Night of the Murdered Poets, expressed the depth of loss and confusion incurred on Yiddish culture by the event.